The sun was burning through morning fog as I walked down Hoyt Street to the subway, the Williamsburg Savings Bank half-shrouded like in some imaginary Gotham. By the time I reached Beach 59th Street, the sky was a deep blue. It was late October, but it felt like summer. I took off my sweater and put it in my backpack. It took more than an hour to get to the Rockaways. 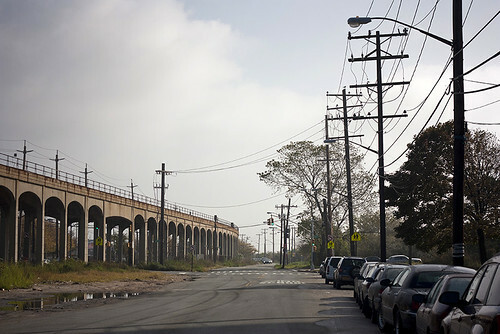 Train service over Jamaica Bay was suspended for track repairs, so anyone travelling past Rockaway Boulevard had to get off and transfer to a shuttle bus that rumbled at its own pace around the perimeter of JFK Airport. The detour seemed to put everyone off kilter. “No, I’m not on the subway, I’m on a bus,” said a woman on her cell phone, as if she couldn’t quite believe it. 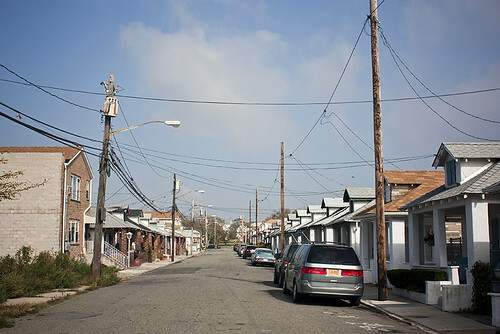 Once the bus arrived at Mott Avenue in Far Rockaway, we had to transfer again, this time to the orphaned stretch of A train that runs along the Rockaway Peninsula, a stubborn eleven-mile finger of land that juts into the Atlantic from the far reaches of Queens. I was there to meet my friend Rossana, who was studying a piece of vacant land along the Rockaway boardwalk for her master’s course in urban planning. She’d invited me to take part in a bike tour of the boardwalk that was being run by a few members of the Rockaway Waterfront Alliance, a community group that is trying to reconnect Rockaway residents to their waterfront. We met at a former fire hall the Waterfront Alliance calls home. There’s a small community garden next door, and a group of teenagers were busy putting up decorations for a Halloween party that would be held that evening. Our group assembled — me, Rossana, her classmate Jon, two local teenagers, a man who said he worked for the city water department, “bringing down water from the Catskills,” and our guide, Mark Hoffacker — and we got on our beach cruisers and rode down a potholed Beach 59th Street to the boardwalk. The wooden planks of the boardwalk drummed a steady beat as we rode past grassy sand dunes. Hoffacker pointed to a fenced-off portion of the dunes, a refuge for migrating birds, and said people often trespassed there, leaving behind garbage. For several blocks, there was nothing but scrubland marked by broken strips of asphalt, along which beach bungalows had once stood. Hoffacker told us the vacant land was now used for dumping cars and refrigerators, though the problem wasn’t as bad as it used to be. (A magazine article from 1992 describes a “Third World” scene of decaying houses, mosquito-infested sloughs and dozens of mafia-run dump trucks unloading toxic waste.) In the distance, the elevated subway tracks loomed incongruously over the bush, its concrete arches streaked with rust. Civilization resumed at Beach 25th Street, where we turned off the boardwalk and rode past a bulky apartment complex shaped like an upside-down T. Halfway down the block we came across a man wearing a Rockaway Brewing Company t-shirt, standing in front of a bungalow with his two daughters. Hoffacker knew him — he volunteers at the Alliance — and he explained that he and his wife had bought the bungalow as a weekend retreat from Manhattan, where they live. Their house was prim and tidy, with a red screen door and two chairs on the front porch; the house next door appeared to be slipping into ruin, its roof sagging, shingles missing, a pile of junk blocking the door. Awhile back, property developers began buying up land for new apartment buildings like the T-shaped one on the boardwalk, which seemed almost comically out of proportion with the pint-sized bungalows, but the financial crisis put a stop to that. We continued our journey along the boardwalk, passing by surfers suiting up for the waves and groups of middle-aged women chatting in Russian, until we reached its eastern end, at Beach 9th. A couple of things struck me about our ride. First was the presence of the ocean. That sounds obvious, but in most of New York, water is everywhere yet nowhere — imperceptible if you’re in most of Manhattan, tamed and industrious if you’re next to the East River, where ferries and water taxis ply placid waters. 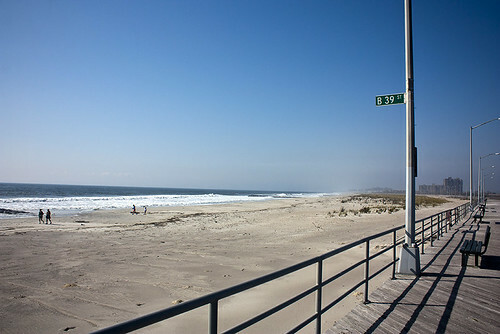 But the Rockaways face the open Atlantic, with its strong currents and roiling waves, always eager to reclaim the shoreline. (In fact, the beach here only exists because of $216 million in engineering efforts over the past 87 years — without intervention, the sand would have already been swept away.) On that bright October day, a stiff wind blew off the water, churning up a salty mist. Sand spread thinly across the boardwalk. It wasn’t hard to imagine a surge pulling the entire structure out to sea. That’s exactly what happened the following week, when the ferocious winds of Hurricane Sandy coincided with a phenomenally hide tide, flooding most of the Rockaways and destroying the boardwalk. The storm left the peninsula stranded for weeks, severing the subway across Jamaica Bay, cutting off power to thousands. “We went about two weeks without heat or water,” said one of the teenagers in Rockaway Stories, a documentary about Sandy’s aftermath. “It looked as if it was a desert … There was sand everywhere, cars flipped over and pieces of the boardwalk in the middle of the street, even in people’s homes.” A year after the hurricane, more than 22,000 people are still homeless across New York, many of them from the Rockaways. The boardwalk still hasn’t been rebuilt. Reopening the boardwalk is more important than it might seem, because the Rockaways are a community without much to bind it together. “We all miss the boardwalk terribly. You walk, you socialize, it’s what brings everyone to the beach,” the chairwoman of the Rockaways community board told the Wall Street Journal. Aside from the power of the ocean, what I remember most about the Rockaways was its isolation, the sense of being far outside the walls. It’s telling that the vast flood-control barrier that was proposed after Sandy would exclude the Rockaways. But exclusion gives rise to resilience and self-reliance. Sandy seems to have provided the Waterfront Alliance new resolve, and it has lent a new urgency to its urban planning works, since the Rockaways’ future development will cement its fate in an era of worsening storms and rising sea levels. For now, the focus is still on basic rebuilding. Many local businesses, including supermarkets, haven’t reopened. But at least the subway is back: emergency funds approved by the state helped the MTA rebuild the subway link to the rest of the city in just six months. This entry was written by Christopher DeWolf , posted on Thursday October 31 2013at 01:10 am , filed under Art and Design, Environment, Public Space, Society and Culture, Transportation, United States and tagged Beaches, Disaster, Hurricane Sandy, New York City, Queens, Redevelopment, Rockaways, Urban Design, Urban Planning . Bookmark the permalink . Post a comment below or leave a trackback: Trackback URL.